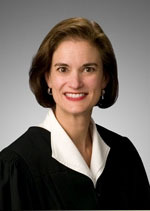 I’m Judge Sylvia Matthews, judge of the 281st District. I was appointed to this bench in 2008 and I am now running for election to this seat. This is a civil trial court. Generally, the cases involve a claim for monetary damages such as breach of contract, personal injury, employment disputes, malpractice, and disputes over property rights, among others. I have had the privilege to serve as judge of this court since 2008 and would like to continue to serve the people of Harris County. I have served as a judge of this court for almost 2 years. Prior to coming to the bench, I had over 20 years of civil trial experience, which included first-chair trials and arbitrations. Through the years, I learned the importance of having your day in court and of listening for both sides of the issue. As a lawyer, I handled all sorts of cases: business litigation, tort claims, and public law matters, as well as complex commercial cases. As a judge, I have heard these types of cases and much more. Since taking office, I have tried to provide litigants with their day in court – I have had a significant number of jury trials as well as non-jury trials. Many citizens do not believe that one judge makes a difference over another until they are required to appear in that court. At that point, they want a judge who will listen to both sides and follow the law when deciding the issues. All judicial races are important because judges make decisions that affect all of us. I chose to leave private practice and become a judge because I wanted to make a contribution to my community through public service. I am a smart, hard-working, experienced judge who strives to follow the law. I’m the kind of judge you want deciding the issues.